The soothing sound of moving water makes a pond a popular garden feature. Add plants to a pond, and you’ve created a water garden. It’s more than just a name change, however. Water plants soften and naturalize constructed water features and play a vital role in establishing a pond’s balanced ecosystem. Water plants are an excellent natural filter. For instance, if you have fish in your pond, the plants’ primary nutrient source is the very waste the fish produce. The fish and plants have a nice partnership. In return for the nutrients, the plants provide food and shelter for the fish. Water plants are also a natural algae deterrent. They consume the nutrients algae need to thrive and their leaves add shade to the water, reducing the sunlight that makes algae grow. There are a wide range of water plants to consider. But, selection becomes easier when you follow a few basic guidelines. Aquatic plants are grouped into categories based loosely on growth habits and their placement in the pond. Each group – submerged, floating and marginal – plays a different role in the water garden. Submerged plants can thrive in as much as three feet of water and include the showy water lily, the delicate water hawthorn and the largely unnoticed but crucial oxygenators such as eel grass and sagittaria. While the lilies and hawthorns add drama to your pond, their less flashy peers the oxygenators are extremely beneficial for water quality. This group of plants releases oxygen into the water and competes with algae for the excess nutrients the algae needs to survive. Add oxygenators to fight the green slime that can grow in water gardens. Fish love the cover of floating plants such as delicate fairy moss or duckweed, as well as popular water hyacinth and water lettuce (However, they are ilegal in Florida). Floaters also provide an overhead smorgasbord for the fish, which graze on the snails and worms that attach to the plants’ dangling, filter-like root systems. You do need to be careful with floaters because they quickly multiply. Start with a few plants to avoid too much coverage. You don’t want your entire water surface to be covered because your submerged oxygenating plants need sunlight; your fish like the warmth of the sun; and exposed water surface allows healthy oxygen exchange. Marginals are planted in shallow water (2-8 inches) and come in many varieties such as cattail, iris, cardinal flower and the rush/sedge family. A broad description of these plants is that their roots are underwater and their stems, leaves and flowers are above the water’s surface. While marginals are usually added to ponds for their beauty, they, too, provide shelter and filtration for pond dwellers such as fish and frogs. Birds and insects are attracted by their flowers. When it comes time to place plants in your water feature, consider sunlight, water movement and, just as you do when planting in the dirt, heights and textures to enhance the pond’s appearance. Most water plants need sunlight to reach their potential, but there are shade-tolerant plants, including water hawthorn and marsh marigold. Consider the water movement in your pond before placing plants. For instance, water lilies prefer still water so plant them away from waterfalls and streams. Place oxygen-loving reeds and water mints in fast moving water. Aquatic plants require little maintenance, which might be one of their most attractive features. In contrast to the weeding, fertilizing, pruning and watering terrestrial gardeners know and love, pond plants only need to be fed once a month during growing season and, of course, weeding and watering isn’t an issue. You should remove spent flowers and dead leaves and stalks to prevent the build-up of silt and algae in your pond. In the summer, sit back and enjoy the plants’ beautiful blooms and textures. When winter returns, there are at least two opinions on what to do. Some water gardeners prune their plants and place them in a deeper portion of the pond that will not freeze. Others prefer a more natural approach and leave the plants in place. In spring, if you’ve moved your plants, return them to their original placement. Aquatic plants are generally in stock May through Labor Day. Stop by to learn more about how these plants are important additions to the health of your pond … and a lovely way to add variety to your peaceful garden. Water lilies or Nymphaea, to scientists – are considered by many to be the jewels of the pond. Not only are they beautiful to look at, but they also serve an important purpose in the pond, mainly in aiding its ecosystem. Water lilies spread across the waters surface, filling it with color and vibrancy all the while keeping the pond and the creatures in it safe and healthy. produce. 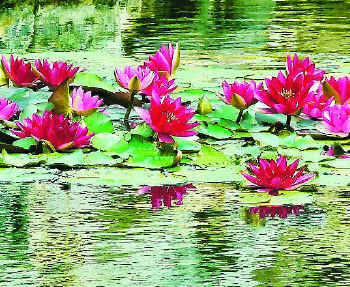 Besides being pleasing to the eye, water lilies do a great deal to maintain the well-being of the ponds they inhabit. For one, they provide shade to keep the water temperature down during the hot summer months. By blocking out a lot of sunlight, the lilies help to keep the algae growth down. Their shade also gives shelter to any fish that may be in the pond – a respite from both the sun and any predators that may be lurking nearby. They also absorb nutrients in the water that would normally feed these undesirable green plants, keeping the water clear and clean-looking. Water lilies grow completely within water, with their blossoms flourishing on top of or above the water’s surface. They typically grow to suit the size of the area in which they are placed, spreading their leaves across the surface of the water and filling it with color. Water lilies require a lot of sun to grow properly. In frost-free regions, they bloom all year. In cooler regions, they bloom during the summer and often into the fall. Throughout their growing season, they constantly generate leaf growth. These leaves live up to three or four weeks at the peek of the season. The most striking feature of water lilies is the incredible amount of variation found among the different plants. From their shape and size, their color and fragrance, or their blooming patterns and growing periods, there is a water lily for every preference and every pond. Water lilies range notably in size – from miniature flowers with small leaves to giant plants that spread over 25 square feet. They come in a variety of shapes – star shaped, cup shaped, pointed or fluffy, though that’s certainly not all. The leaves can be smooth or jagged, rounded or pointed. The colors are just as varied, ranging from yellow, pink, red, white, purple, blue and orange. Several types of lilies are incredibly fragrant, as well. In the center of all water lilies are golden stamens – the organ of the flowers that bear pollen. When the lilies are young, the stamens stand straight. As the flowers age, they begin folding and curling into the flower. The variations found in water lilies are especially pronounced when one breaks down the genus further, into hardy water lilies and tropical water lilies. They are similar, but they are not closely enough related to be naturally cross-bred. While both need a lot of sun to bloom and to thrive, tropicals, unlike hardies, can still bloom with as little as three hours of sun in a day. That said, tropical water lilies can be either day- or night-flowering plants, while hardies only open during the daylight hours. Tropical water lilies also start blooming later in the summer than hardies; however, they remain in bloom for longer than hardies. Tropicals also tend to have larger plants and larger blossoms than their hardy counterparts, and tend to hold their blossoms higher above the water than do the hardies. These are a few of the differences between the two types, but the list continues. Both subgenres – hardy water lilies and tropical water lilies – have their own characteristics and their own needs, as outlined below. The leaves of hardy plants are circular in shape with smooth, round edges. There is a waxy cuticle covering their surface. These features all aid in their survival: the shape helps to protect them from tearing in rough winds or waves, while the waxy cuticle allows the water to roll off the surface so that the leaves do not sink. Hardies come in a variety of colors, ranging from red, salmon, pink, white, yellow, orange, peach and nearly black. There are some varities – called changeable water lilies – that change their color over their bloom period (of three to four days). Hardy water lilies are the first of the lilies to come into bloom in the spring. Once the water temperature holds steady at 60 degrees, they will begin to bloom, spreading their pads across the pond with their blossoms eventually floating on or just above the water’s surface. These shallow-rooted plants need plenty of room to grow and spread up and out across the pond. In the early spring, these fresh lily pads will begin to emerge on the water’s surface. Many of the lilies will be in bloom by mid- to late-spring. They bloom throughout the warm-weather months, eventually becoming dormant in the fall. These are perennial plants, meaning that as long as the rhizome – the underground stem that sends out roots and shoots – does not freeze, the plant will survive through the winter and bloom again in spring. Come winter, in areas with no frost, they will continue to grow, however their growth will certainly slow down a bit. Year-round blooming is possible in frost-free zones. In areas with frost, however, the lilies survive through the winter only if they are below the pond ice. These are not night-blooming flowers. Indeed, they are open in full bloom by mid-morning and are closed again by mid- to late-afternoon. 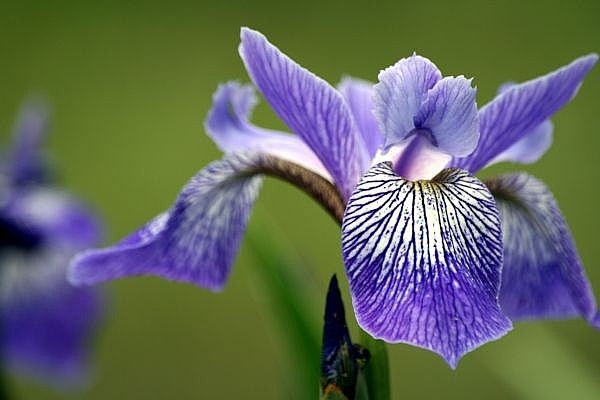 Though each flower will last approximately three to five days, new flowers will constantly open throughout the season. The lily pads of the tropical plants come in different shapes, typically smooth, toothed or fluted. The edges are usually jagged and pointed and may even look ruffled. The pads are larger than the hardies, often taking up much more space in the water than they do. Tropicals blossoms are impressively sized – some span more than a foot across. Like the hardies, they come in many different colors. The two subgenres share the same color palette, for the most part (red, salmon, pink, white, yellow, orange, peach and near-black), but these types also come in blue and purple. Though hardy water lilies are indeed very beautiful flowers, it is the tropical lilies that command – and capture – the most attention. They are larger and flashier than the hardies and tend to be more fragrant. They also tend to bloom for a month or two longer, stay open later in the day, and are more likely than hardies to produce multiple flowers at any given time. The tropicals require warmer temperatures than do the hardies to bloom, thus making them a bit more difficult to grow. After three or more weeks of temperatures above 80 degrees, these flowers will finally start to open up and bloom. Once they do, they fill the ponds with their colorful blossoms throughout the summer months and well into fall. After the hardies have gone dormant, the tropicals will stay in bloom for several weeks longer, often until the first frost. During the winter months, however, they go dormant and die. 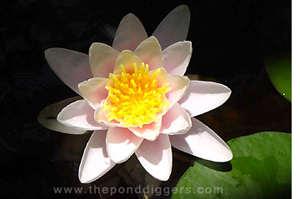 There are two kinds of tropical water lilies: night bloomers and day bloomers. Lilies in the white, pink or red color range tend to be night bloomers, and these types are typically more fragrant. These flowers can take an entire hour to fully open, and tend to open in the late afternoon or early evening and close the following mid-morning. 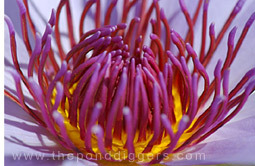 Day bloomers, however, are the most common kind of tropical water lilies. They are fragrant, as well, but their scents are usually lighter and sweeter than the heavy-scented tropicals. Day bloomers have pointed petals and come in various shades, from magenta, red or pink, to white or yellow, or to blue or violet. They open midmorning and close again during the late afternoon hours. The blooms of both day and night bloomers open and close for periods of three to four days, holding their flowers above the water on strong, stiff stems. 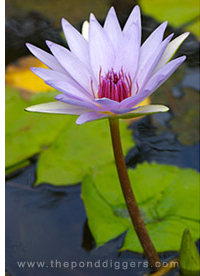 There are two options when it comes to planting water lilies. They can either be planted in aquatic plant pots (the kind with no holes in the bottom) or directly in a hole created at the bottom of the pond. The planting of the lily itself will not be affected by the method you choose. Once you determine whether to use plant pots or plant pockets, you can begin the whole process. With plant pots, a hole is created in the bottom of the pond into which the pots will be placed. These holes at the bottom of the pond must be able to accommodate the pot, so it is important that they are deep and wide enough. Once the vessel has been chosen and the lilies have been planted, you can place the pot into the hole. Take heed: the pot must lie directly on top of the soil at the bottom of the hole on level ground. 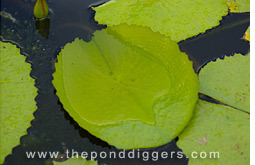 The size of your pond will determine the size of the container you use or the hole you dig. Again, lilies grow to suit the size of the area they are in – keep this in mind. As a rule, the larger the vessel, the larger the lilies will grow. Water lilies thrive best in heavy garden topsoil, but take care to make sure it has not been mixed with other substances such as manure or compost. When determining where to place the water lilies, one must keep in mind that they do not thrive when faced with heavy water movement or with water splashing on them. Therefore, they should not be placed near waterfalls, streams or other such potential problem areas. 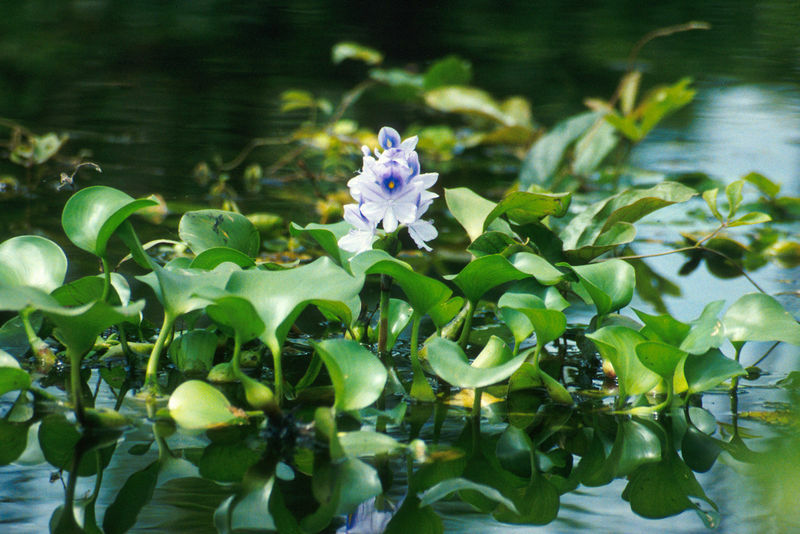 Maintaining the well-being of the lilies is vital for keeping ponds beautiful. Lilies should be fertilized regularly. 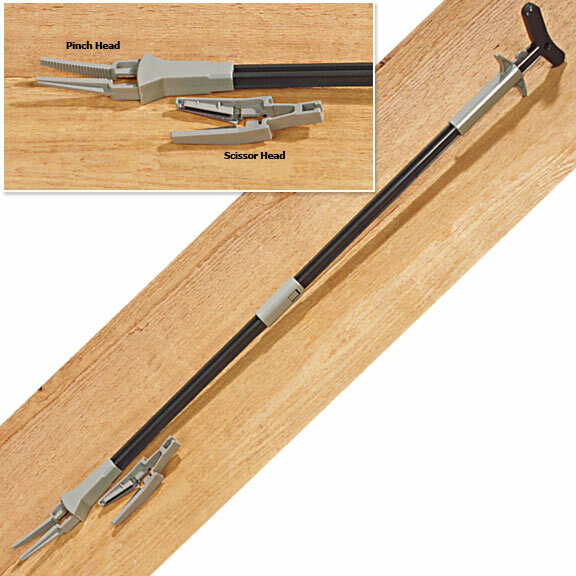 This will help the flowers to grow larger and to bloom more frequently. You also must take care to remove all dead or yellowing leaves from the plant’s surface so they will not sink to the bottom and decompose. You should also keep the stems trimmed, pruning them as close to the rhizome as you are able. There are some differences between hardies and tropicals, however, in terms of their planting and maintenance. Ideally, you should set your hardy lilies out once the early spring chill has subsided but before they begin growing. Doing so will enable them to produce blooms their first summer. If you buy the rhizomes before you can plant them, keep them submerged in water and leave them in a cool place and away from directly sunlight. These lilies should be planted in pots or holes six to eight inches deep or in pots of a nine- to 20- (or more) quart capacity. The smallest pots recommended for standard and larger sized lilies are nine- to 10-quart containers. At least a five-quart container is recommended for the smaller lilies. Fill the container about one-third of the way with topsoil then place the seed on top. Then cover the seed with soil so that the tip is just barely peeking through the soil. The blossoms of hardies will rise to the surface one at a time every three to seven days. Maintenance is key, especially with hardies whose leaves continuously die and grow back throughout the growing season. Yellow leaves and four-day-old blossoms should be removed regularly. You should stop fertilizing hardy lilies in the early fall season as the growth of the plant slows. Hardy lilies can live through the winter, but special care must be given to them during this time. In cold regions, they will survive if they are below the ice. If the pond isn’t deep enough to lower the containers as needed, remove the pans with the lilies in them and take them to a cool location. Keep them covered with damp material, such as a damp cloth, then seal them in a plastic bag to keep them from drying out. In areas where frost does not threaten the growth of the lilies, their growth will slow down significantly but will, nonetheless, continue growing. 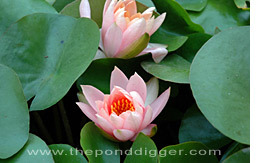 With tropical water lilies, planting should commence once the pond water has maintained a steady 69 degree temperature. It is very important to note that planting them before the water has reached this temperature may cause serious damage to the plants. They can go dormant – or, at worst, die. They must be planted immediately; unlike their hardy counterparts, these water lilies will not last more than a couple of days without the proper growing conditions. These lilies should be planted in 15- to 20-quart tubs. They should be planted so that there are six to 18 inches of water growing over their tips. They will begin growing roughly two weeks after they have been planted and then will begin blooming in another two to four weeks. They should be fertilized about twice a month. In frost-free regions, tropicals will bloom year-round. In areas prone to frost, however, they do not fare the winter quite as the hardies do, and will die after a few bouts of frost. Many pond owners choose to replace them each spring. If they survive the winter, they should be repotted in fresh soil and fertilized as usual. Once these steps have been taken, they can be placed back in the pond another season of growth and enjoyment. Cool Ponds answers your cold weather pond questions…. Winter is a transitional time for a pond. From fish and food, to equipment and plants, caring for the pond in the winter is an important time for your ecosystem. 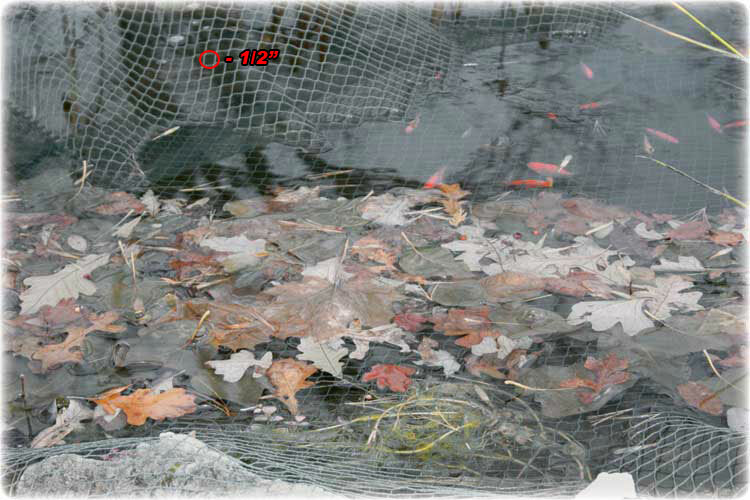 In most parts of the United States fish can be left in the pond during the winter, providing the depth of the pond is adequate (18 inches minimum or deeper in harsher climate zones). Fish will gather in this deepest area of the pond where the water temperature remains more stable and go into a state of hibernation during the winter months. Note that some types of fish, such as plecostomus (sucker fish/algae eaters), fancy goldfish with ornate tails, bubble eyes and lionheads, are sensitive to cold weather and should be brought indoors. 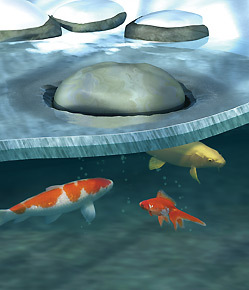 Here at Cool Ponds, we leave our koi and goldfish in our ponds. As winter approaches, you should monitor pond water temperatures daily. When your water temperature is between 70°F – 50°F, you should feed a cool weather fish food (available at Cool Ponds). Once the water temperature falls below 50°F, you should stop feeding the fish altogether. Some may worry about not feeding their fish, but you can rest assured that your fish will naturally rely on stored energy reserves built up during the summer to sustain them throughout the winter months. Cool Ponds sells pond thermometers perfect for monitoring your water temps. In the past, readers have asked us for advice on what to do if they are NOT closing up the pond because they live in a warmer climate. If you live in a spring or summer-like region, like we do at Cool Ponds, we suggest you continue to monitor your temperatures and follow our Cool Ponds Seasonal Feeding Cycle. If you have premium Koi, continue to feed Blackwater Creek Cool Season Koi Food. Blackwater Cool Season food is blended to be easily digested during the seasons when water temperatures stay below 60°F (16°C). During this time of year your fish’s metabolism slows and digestion is more difficult. The Cool Season diet contains a complete mix of ingredients for the cooler times of the year. Feed this diet prior to breeding season to reduce fat deposits and the possibility of “egg-bound” females. If you live in a cold climate, disconnect the pump, filter and UV clarifier before water freezes. Be sure to store the UV clarifier indoors for protection. It is also a good idea to store filters indoors (if manufacturer’s directions suggest). If you live in a northern climate zone where your pond will freeze over, it is very important to purchase or have a pond de-icer ready for installation. Gases, which are produced by decomposing organic material, are toxic to fish when they are trapped beneath ice covering the pond’s surface. Only a small hole is needed to allow these gases to escape and ensure the survival of your fish. Most aquatic plants (with the exception of tropical lilies, water lettuce and water hyacinths) can be left in the pond through the winter. Trim back all dead foliage, and then submerge the plants in the bottom or deeper section of the pond to prevent the plants from freezing. Hardy water garden plants will come back year after year. Consider bringing tropical lilies, water lettuce and water hyacinths indoors for the colder months.